This chapter describes methods to reduce number of feature by extraction or selection. An important pre-requisite for training robust classifiers is construction of an informative data representation. This chapter is organized into two parts. First, we discuss feature extraction and then feature selection methods. Two basic types of dimensionality reduction include feature extraction and feature selection. Feature extraction results in a lower-dimensional space constructed using information from all original features. Feature selection, on the other hand, chooses a smaller subset of the original features. This is useful to identify the informative features, and to limit computational demands when executing the recognition system on new observations. Two prominent feature extraction methods are Principal Component Analysis (PCA) and Linear Discriminant Analysis (LDA). The major difference is that PCA is an unsupervised approach (not using ground-truth labels) while LDA is fully supervised. PCA derives lower-dimensional linear subspace by preserving a specific fraction of variation in the original data. It is implemented using the sdpca command. This feature extraction method ia unsupervised. This means that the class labels are not taken into account. Therefore, the presence of labels in the data set does not alter the resulting PCA projection. Running sdpca without additional arguments results in a decorrelation of the data (mere rotation) preserving all information in the original data set. This is useful, for example, when building classifiers that makes use of thresholding (decision trees) or assumptions of independence (naive Bayes). Note that sdpca always displays how much of original data variance is preserved. The sdpca splits the data set a into training and validation subsets (by default 50/50). The model (in our example sdlinear) is trained on the training part and its error is evaluated on the validation part. The resulting PCA projection uses dimensionality minimizing the error. We may adjust the fraction of validation data using 'tsfrac' option. TIP: It is a good practice to perform PCA on a data set we start working on in order to understand its complexity. If the PCA preserving some 95 or 99% of variance results in significant dimensionality reduction, we probably deal with data located along a simple manifold structure. This is often happening for signals or image data sets. If the resulting dimensionality is high compared with the original number of features, we face a complicated problem and may need more complex classifier and consequently larger number of training examples. LDA is a supervised feature extraction method that finds a linear subspace maximizing separability between classes. The dimensionality of the resulting subspace is fixed to the minimum between: number of features, number of samples, number of classes - 1). Usually, the output dimensionality is determined by the number of classes. For a two-class problem LDA results in a projection on a line, for thee-class problem on a 2D plane. LDA projection may be computed for data sets with number of features larger than number of classes by using the pseudo-inverse. However, we should carefuly investigated the generalization capability of such projections, i.e. the capability of reliably mapping unseen data. One possible remedy for poor generalization capability of LDA in high-dimensional small-sample size problems is to first perform PCA and estimate LDA projection only in lower-dimensional subspace of the original data set. Special form of representation building is feature space expansion. Instead of reducing the dimensionality, it generates new features based on the original ones (therefore it's similar to extraction). sdexpand implements polynomial expansion adding powers or cross-products of existing features. This is useful in order to build non-linear or more complex classifiers using simpler models. It is used by default in the logistic classifier sdlogistic. Feature selection strategies aim at selecting an informative subset of features out of the complete set. The goodness of a solution is judged based on a criterion or on the classification error. perClass includes fast feature selection via the sdfeatsel function. By default, sdfeatsel selects features by minimizing the error of 1-NN classifier trained on a part of the data and tested on the remaining test set. Leveraging classifier error as a feature selection criterion has the advantage of providing a clear decision on how many features are needed. In the simplest scenario we know what features we want to select. We may provide the data set and desired feature indices or names manually. This is useful, for example, when we build a cascaded system with several classifiers, each trained on a different subset of the entire feature set. The pf.inlab stores the input feature names. This is useful later on when we load a classifier trained earlier in our project. We can always see what features the pipeline uses from the input data. The individual search evaluates each feature separately. The advantage of individual search is high speed. It is therefore useful for pre-selection of a candidate feature subset from a large set of features. Note, however, that individually poor features may yield high class separability when used together. Because of internal splitting into a subset used for classifier training and subset for criteria evaluation, this default selection process may yield different result each run. To make selection repeatable, you may split the data set yourself outside and provide the two sets separately using the 'test' option. The data set tr is then used for classifier training and the test set ts for error estimation. To inspect the feature selection process sdfeatsel provides, as the second output, the structure with detailed information. Random search evaluates a large set of random feature subsets and returns the best one. It is useful to implement more complex feature selection strategies such as genetic feature selection or as an initialization of greedy searches. For example, the forward search suffers if all features judged individually are poor. Bad choices made early on in greedy search cannot be undone. Random search allows us to start the greedy search from a meaningful feature subset. The res structure contains all analyzed feature subsets in a binary matrix res.subsets (subsets vs features). The criterion values are stored into res.crit. The number of evaluated random subsets can be changed with 'count' option. The length of subset sizes can be controlled with 'bounds' option. The forward search is a greedy strategy. It start with the best individual feature and adds to it the feature that together with the first provides the best result. The procedure is repeated until all features are used. Therefore, in the forward search, the merit of additional features are judged together with the already selected subset. Number of features is selected automatically because the selection criteria uses classifier error. If no test set is provided the input data set is split randomly into two parts, one used to train 1-NN classifier used as criterion, and the other to estimate the performance. Due to the random splitting, repeating the search on the same data may result in different subset of selected features. The default splitting fraction is 0.75 (75% of data used for training). The fraction may be changed using 'trfrac' option. Additional information on the feature selection process may be retrieved using the second output: the structure res provides the best subset found and also all subsets analyzed together with the criteria values. The backward search starts from all features and gradually removes the features until the performance improves. The floating search combines multiple forward and backward steps gradually improving the best feature subset found. If not initial feature set is given, the floating search is initialized by the random search. Floating search uses full forward and backward search steps. Therefore, it cannot provide a single nested list of features. Instead, the res structure contains a cell array with a feature subset for each floating step and corresponding criterion value. 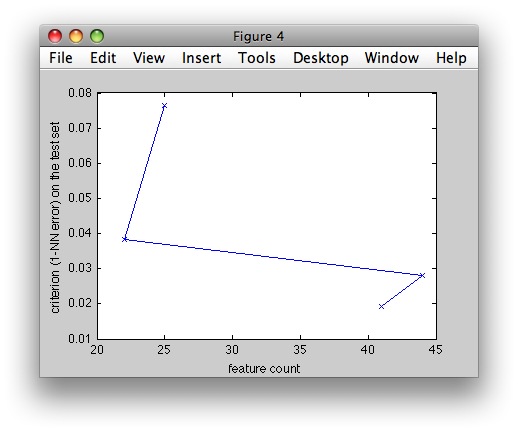 The x axis shows the number of features in each floating step, the y axis then the corresponding 1-NN error on the test set. Decision tree classifier may be used as a feature selection technique. For details, see this example.